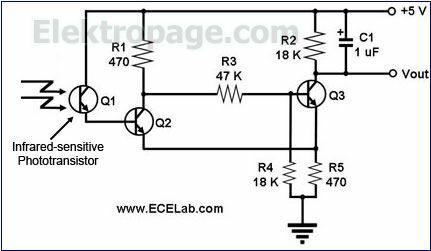 This is a circuit for detecting the presence of fire. This simple project is often incorporated in small roving robots - the ones that robotics hobbyists love to build. A flame, even one that is barely visible, emits significant infrared content. Thus, the sensor of this circuit is an infrared-sensitive phototransistor Q1, which is basically a transistor whose base is excited by infrared rays instead of input current. As more infrared rays shine on Q1, the more conductive it becomes. When there is a flame or fire nearby, Q1 will conduct, feeding current to the base of Q2. At a certain threshold, this current will be large enough to turn on Q2, which will pull down the base of Q3. This will turn off Q3, causing Vout to be pulled high. Vout may be used to excite a light-emitting diode or an alarm circuit. In the absence of a nearby source of IR rays, Q1 will be ´off´, and so will Q2. This will allow the base of Q3 to remain ´high´, causing Q3 to remain ´on´ to pull Vout to ´low´. This circuit will require optimization of the sensor position and experimentations with the R1 and R3 values to achieve the proper sensitivity. An infrared filter might also be required by the phototransistor if it is being affected by too much ambient light.